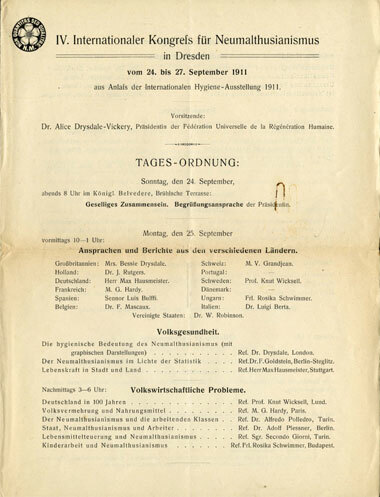 This international neo-Malthusianism conference was organized from 24-27 September 1911 on the occasion of the Internationale Hygiene-Ausstellung (International Hygiene Exhibition) in Dresden. Following on this event the first international Kongress für Mutterschutz und Sexualreform (International conference Protection of Mothers and Sexual Reform) was held between 28 and 30 September. An excursion to Meissen was scheduled for participants of both meetings on Sunday 30 September.